Christmas holiday, finally. At last, I should have enough time to talk about all the interesting teas that have been accumulating on my shelf for quite a while. Let's start with yet another Katahira – or let's get back to Katahira, to be more accurate. Here's a tea from this great Nunosawa, Shizuoka-based producer I haven't talked about yet – a tea, which is, among his classic Senchas, presumably of the highest grade. Purchased from Pu-erh.sk quite a while ago, Sencha Kaori was picked in May 2012 and is a blend of four different breeds - 30% Ó Iwase, 30% Meiryoku, 20% Yamanoibuki, 20% Saemidori. Its leaves are long, light-steamed shiny green needles, very beautiful and obviously processed with great amount of care. They have a sweet, fine smell; one that is fresh, fruity and creamy. The first infusion is light-yellow in color and gets gradually more opaque as it cools down. Its taste is sweet, very refined, deep and complex – from tones of ripe fruit, such as pears and gooseberries, to sweet cream, milk and vivid umami, almost reminiscent of half-shaded or shaded teas. These notes are continued in a long, mouth-filling aftertaste, again very deep and sweet, though also fresh and very fruity. The second infusion is yellowish-green in color, very clear and slightly cooler in taste. Again, tones of fruit, sweet cream, umami, deepness and overall refinement. A medium-long aftertaste; slightly lighter than before, more refreshing and, for a second brew, still very sweet without any sharp notes. Two more infusions are made of these leaves; the third one still a deep, complex brew with sweet fruity and creamy notes, getting just a bit drier in the ending. The fourth, the final – light green color, a lighter, drier and simpler taste, less deep, though still mostly fruity, creamy and very clear. This taste stays in the mouth for along time, the aftertaste still doesn't get any less refined. All the sweetness and creaminess previously encountered, still not planning to leave. Impressive. I've purposely made the taste notes shorter this time to get to the question already mentioned in the name of this post - this tea seems almost perfect. Sometimes I think it's too perfect, actually. There's this thing about such high-grade, traditional Sencha teas, especially the blended ones – they are very refined and good from all points of view, mostly, which, actually, detracts a bit of surprise from the experience. It is important to say that this has nothing to do with quality of tea in any way – it's just a matter of personal preference. I seem to enjoy teas that are able to surprise me, teas that get stuck in my mind for whatever reason more than teas which are just great – in a classic, conservative, traditional way. Just one example, purposely from the same producer – Sencha Tsuyuhikari. This tea, Sencha Kaori, tastes exactly how it's supposed to taste. Exactly how a Sencha of such a high grade is supposed to taste. There is absolutely nothing wrong with that. It's just that sometimes I think tea is quite similar to people. When you're around someone who is perfect all the time, there is quite a high chance you are going to get bored. Of course, these teas are not meant to be consumed every day, so such case probably isn't going to happen. This is definitely a great tea. Try it, drink it, enjoy it. You won't be disappointed. You might not be surprised. But, after all, that is not what these teas are meant to do. This is the second of two samples kindly sent by Peter Stanik of Pu-erh.sk some time ago – I talked about Kabuse Daitsuin, the first one, in the previous post. So, just a quick reminder – these teas come from Ohira tea estate located in Shizuoka and are grown in what can be considered a mountainous area – elevation of 500-1000 meters. Ohira's Sencha has shorter, presumably middle-steamed leaves, lot of them broken, but overall quite attractive, shiny and dark-green. Their smell is sweet, fresh and slightly roasted. The first infusion is light green in color and just as light on tongue; its soft, clear taste comprises tones of roasted nuts, almonds, creamy sweetness and milkiness. This tea is far less fruity than most Senchas from Shizuoka, instead providing an interesting combination of warm, nut-like notes and light, soft character – in a way, it almost reminded me of some higher-grade Kamairicha. Its aftertaste is quite warm, sweet and very refined. This is something that Sencha Ohira shares with its Kabuse counterpart – this unusual, refined lightness and purity, that, in my opinion, might be a result of its high-mountain origin. Interestingly, it keeps this lightness even with higher dosage of leaves and longer brewing time. A big positive in my eyes, especially with Japanese teas, which are often very easy to overbrew. The second infusion is again light green in color, while its taste is now slightly sharper and slightly fruitier – tones of almonds, milk and plums. Though still very soft and fine, this brew also gains on the typical Sencha green freshness, while it loses a bit of the former roasted tone. Its aftertaste is now more vivid; still warm and sweet, but less creamy and more fruity. The third infusion is light green, completely transparent and has a taste profile similar to the second brew. While quite sharp, it maintains the lightness, purity and some of the former creamy sweetness, though it now showcases more of the fruity tones – again, plums. These are accompanied by slightly spicy nuances, as well as a hint of woodiness. The aftertaste is medium-long, mouthfilling and less sweet than before, dominated by fruity sharpness. The last, fourth brew is sharp and simple. Green color, spices, woodiness. Warm, humble finish. Peter Stanik, the owner of Pu-erh.sk, kindly sent me samples of two new Japanese teas in his offering, teas that seemed interesting just from reading the description – one Sencha and one Kabusecha from Ohira tea estate, a grower who's never sent his teas abroad before. Moreover, grown in mountainous part of Shizuoka – when talking about Japanese teas, elevation of 500-1000 meters above sea level can almost be considered high-mountain. First, I have decided to try Ohira's Kabuse. 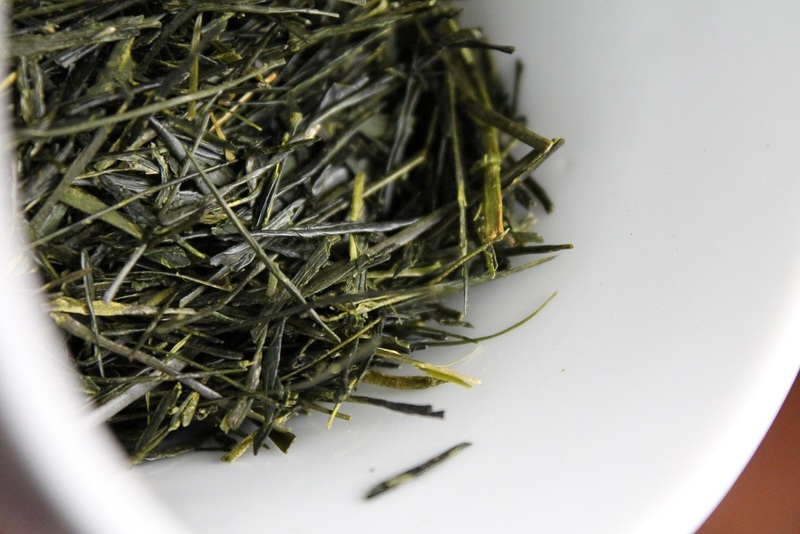 This tea has shorter, probably medium-steamed (chumushi) leaves; beautiful shiny, dark green, almost blueish needles. They emit a soft, sweet smell of ripe fruit, flowers and cream. The preheated Shiboridashi intensifies this aroma. As the water cools down, the first infusion is prepared – transparent, light yellow in color, with a taste that is round, clear and light - lighter than most shaded or half-shaded teas, actually. Tones of grapes, milk, hazelnuts and apple juice. Though light overall, this brew also shows significant amount of umami and warm, creamy sweetness. Long, refined aftertaste; not too strong, not that aggressive, but indeed complex, deep and dominated by green grapes and light sweetness. All this accompanied by a calming effect on mind, again, different from most Kabuse teas – again, quite light, yet perceivable. The second infusion gains strength as expected. Its color is now green, still transparent and very clear. This brew tastes slightly sharper, though still very light and pure, with strong umami, predominant fruity tone of apples and grapes, followed by creamy sweetness, milk and nuts. The aftertaste is, again, light but long, just a little shorter than before, very pure and with nuances of fresh, green fruit, vanilla and leaves an unexpected feeling, reminding me of pines and conifer forests – a walk in the mountains, almost. I'm always fond of such an effect in Japanese teas. The third brew keeps the second's green color and returns to the rounder character of the first infusion, though providing less deepness and more of the nutty, spicy tones with slightly weakened sweet, milky notes. Still very pure and light, this brew has a medium-long aftertaste, more mouth filling than before and dominated by vanilla, hazelnuts and apples. One more infusion is prepared with significantly hotter water; a touch of sweetness, green freshness and spicy, woody simplicity. A warm, satisfying finish. No tea today. No unnecessary words. Just some impressions of today's walk in the woods surrounding the village I live in. Impressions of this Autumn. Yet another Houkouen tea – Houkouen is the name of a company operated by Mr. Katahira, a well-known Shizuoka farmer and producer. 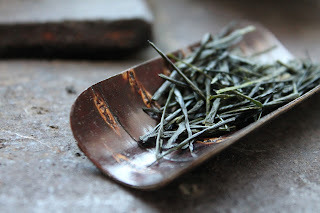 Purchased from Slovak shop Pu-erh.sk, this Sencha is made of a single cultivar – Tsuyuhikari. Again, a classic in Mr. Katahira's offering, Tsuyuhikari is a breed grown mostly in mountainous areas of Shizuoka. 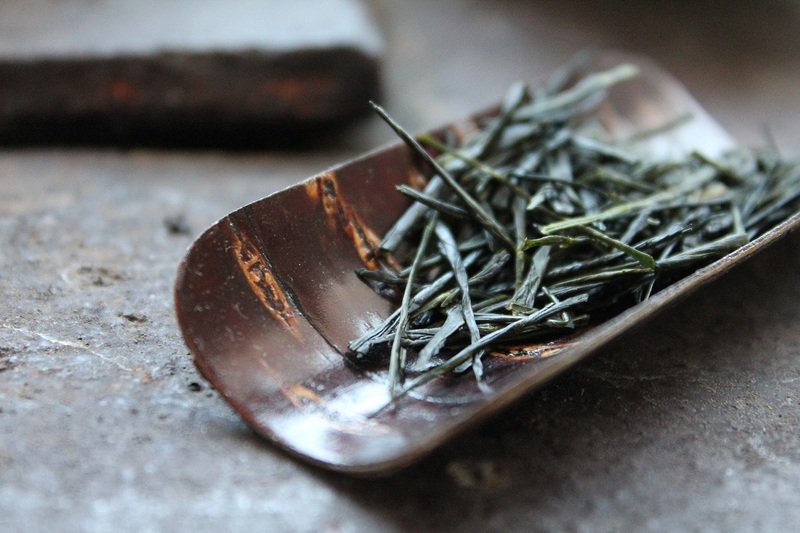 This tea was picked in May 2012 and comes in a form of some really nice, shiny, long green needles. These leaves have a lovely fresh smell with tones of young fruit; this smell seems to be slightly lighter and fresher than that of most Sencha teas by Mr. Katahira (maybe with the exception of Koushun, which I will talk about soon, hopefully). The first infusion is yellow in color, slightly opaque and has a refreshing, clear taste with tones of green grapes, young peas and overall freshness. This tea is sweet, but not too sweet; also, being as refreshing as it is, its taste is surprisingly deep and refined. It lacks any astringency and instead leaves a long, evolving aftertaste which fills the mouth with fruity coolness, mild sweetness and a very well-balanced amount of light, green freshness. Just few seconds of brewing for the second infusion; the resulting cup is once again yellow in color, though now more transparent. Its taste is slightly sharper, warmer, dominated by tones of autumnal fruit – apples, mostly. There are also some nutty and slightly spicy tones – and even with all these notes, the freshness is still here, especially in the aftertaste. It feels almost like a surprise – after such a warm brew, the aftertaste feels unusually cool and refreshing. Another part of this tea's interesting character. The third infusion marks the return of first brew's character, being lighter, almost greenish-yellow in color, transparent and pure in taste with overall lightness, freshness and tones of grapes, pears, young peas and just slight nuttiness. Somehow, this one is the sweetest of all infusions. The following aftertaste: moderately long, mild and refined. Fruit, sweet cream, freshness. One more brew is prepared. Greenish-yellow, completely transparent, warm in character and quite simple; this is a nice, nutty finish with mild woody and spicy nuances. Warm enough not to leave you cold even on a chilly November day like this. So many teas, so little time! That's pretty much what's been on my mind for the past month or so. This Kabuse is just one of seven Japanese teas that have been lying on my shelf for quite a long time now, most of them since summer, and more are still coming – not to talk about teas from other countries, as there is quite a lot of them I would like to talk about as well. Nevermind. Let's just hope I will get more free time in the forthcoming days to cover them all. 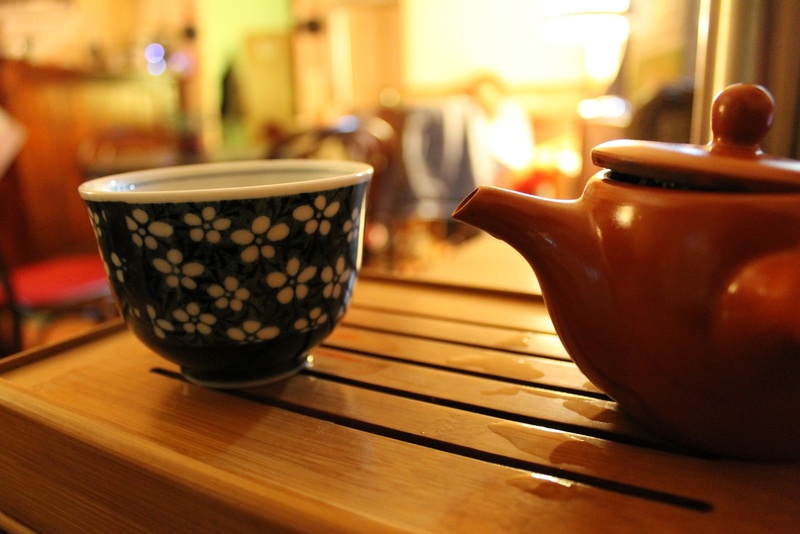 This Kabuse (half-shaded) tea is made of Okuyutaka breed and is quite a classic in Mr. Katahira's offering. I purchased it from Slovak shop Pu-erh.sk, operated by Peter Stanik. Its leaves are typically long needles, shiny and dark-green, with subtle, cultivated smell – vivid sweetness, almonds, cream, milk and raspberries. Much more than that, countless tones of various kinds of fruit, flowers and spices. Such smell already showcases the complexity of this tea. The water is cooled down for the first infusion, which is light green in color and quite clear and transparent at the beginning, though it gradually becomes opaque as it cools down. Its taste is very sweet, round and with great amount of umami; a well-balanced experience for tongue with numerous tones – hazelnuts, almonds, raspberries, caramel, sweet cream and a warm character, reminiscent of high-grade Gyokuro. Its aftertaste is a long one, filling the mouth with creamy sweetness for a long time. It has a significant effect on mind as well – at least in my case, this tea helps me to calm down a lot (not in a sleepy way, though), though I've witnessed people saying it has the opposite effect on them, actually giving them a lot of energy (which is logical, considering the fact that Kabuse teas are generally quite high in caffeine). The second infusion is yellowish-green, almost completely transparent and has a very vivid taste. Even though, it still doesn't show any traces of bitterness or even sharpness – this is one of the “roundest” teas I've recently encountered. This brew is mostly dominated by fruity notes, namely raspberries and a slight hint of sweet, ripe plums. As with the previous infusion, the umami is very strong. So is the nuttiness and sweetness. The aftertaste is once again quite long-lasting and, just as the infusion itself, mostly dominated by various kinds of fruit and overall warmness. The third brew has a light green color, medium transparency and is slightly sharper in taste, which now possess a mild refreshing side to it as well. This infusion is a bit less deep than the previous two, being mostly fruity, spicy and with shorter, more vivid aftertaste. One final infusion is made of these leaves, similar in character to the third brew, just a bit flatter and simpler. Nuances of spices, fruit and sharpness. Some nuts, some slight woodiness. Quite a refreshing, nice finish. In the end, I must say that Mr. Katahira's Okuyutaka Kabusecha has probably been my favorite amongst his teas for a long time – and this year, it seems to have turned out exceptionally well. One evening, one lovely tea, one favorite place of mine - the 2012 Sencha Sayamakaori Miyazaki at Avra Kehdabra teahouse in Bratislava. Necessary to say, I'm not a native English speaker (as you have probably already figured out from my entries), so please forgive me my mistakes and limited use of language. Other than that, I am an eternal student deeply appreciating good tea and all joys connected to it. Among my other interests is poetry – apart from reading, I also try to do my best in writing it. Then goes film, which is a big passion of mine as well as my field of study. Naturally, I would like to continue and deepen these interests in the future.